Here is what is known to have transpired: After hostile exchanges over Facebook, six or seven teen boys of color, including Isaiah, arrived in front of Dylan’s home, driven by 19-year-old Nia Phillips. Knowing that violence had been threatened online, and seeing Isaiah open fire on Dylan and another boy with what Dylan didn’t know was a BB gun, Dylan, then 15, ran into the house. He eventually returned to the scene with a kitchen knife, and upon seeing Isaiah on top of his friend, stabbed Isaiah twice. Unfortunately, Isaiah died at the hospital from those injuries. Police investigation later found one of the teen boys who had accompanied Isaiah trying to ditch a knife; more than ten knives were found in Nia Phillips’ vehicle. After the incident, police arrived at Dylan’s home to take him in for an interrogation. His mother requested to accompany him, but the officers refused. It is not clear when they officially placed him under arrest, but they read him his Miranda rights at the station when he was alone. Since no lawyer was at hand, and in the presence of adult officers, he did not seem to perceive the exercise of his right to decline to speak as a viable option. On a tape, later played in full during the trial, Dylan denied several times that he was in a gang before he seemed to say he might have been in one: “sometimes a gang member … and sometimes not.” It is at this moment – given that the trial placed heavy emphasis on these words – that what we believe was a kind of racial profiling of Southeast Asian Americans kicked in. For the purposes of standing trial, Dylan was designated an adult, which meant that while awaiting trial he would serve a year in de facto solitary confinement to separate him from the adults whose jailhouse he shared. It is also why he would stand to be sentenced to 60 years in adult prison if convicted of the charges against him. Now, months after a jury found Dylan guilty, he still serves alone, waiting for resolution on his actual term of incarceration. A decision will not to be made until September. 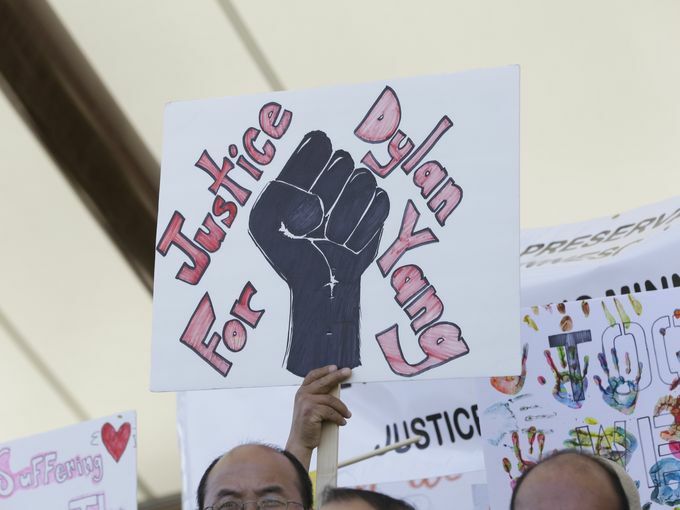 When a group of hundreds of supportive demonstrators marched outside his prison walls chanting “I am Dylan Yang,” he was prevented from hearing them because the guards had turned the television sound up too loud. Despite being the only person in this conflict facing a serious charge in adult court, Dylan was also left without a lawyer: the public defender’s office claimed a conflict of interest since they were representing the other kids involved in the incident. Dylan went a month without an alternate court-appointed attorney. By the time the public defender’s office finally appointed one, his family had already hired Jay Kronenwetter, who was simultaneously running for mayor and preparing for an imminent election. During the gap in legal representation, Dylan’s family had spent a week scrambling in vain to find him any legal counsel. Most attorneys who initially signaled they would take Dylan’s case demanded a prohibitive fee of $20-30K up front, which Dylan’s family did not have. Meanwhile, what became of the other kids in the confrontation? Despite being the only adult involved in the case, purchasing the BB gun, and knowingly driving the minors to engage in potential violence, Nia Phillips was given three years probation and 300 hours of community service. The boys who accompanied Isaiah were tried in juvenile court and reputedly given slaps on the wrist with no prison time. Although his trial is over and Dylan’s case is transitioning to the sentencing phase, his family has hired a new attorney, Harry Hertel, to represent him going forward. Hertel hopes to seek a retrial based on the assignment of “ineffective counsel” to his predecessor. The sentencing date was pushed back from July to September, perhaps also out of consideration for the letters that are piling up at the court from people across the country urging leniency. 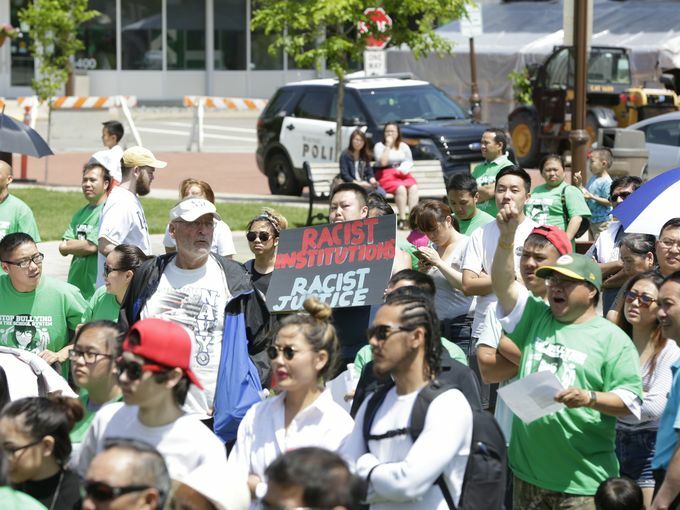 In the Midwest a Hmong-led network called the JUSTICE team has organized rallies and disseminated a call for pleas to the judge. National organizations are beginning to come forward to offer help in constructing Dylan’s defense. As sentencing looms, constituencies have mobilized, but what preconditions may shape the outcome? Our grave concern is that our society’s chronic over-attribution to youth of color as questing after trouble, and as putatively rushing to arm themselves in the process, is simmering in an already noxious stew. Also bubbling away in this cauldron are racial biases overridden by dominant effacement of racist institutions, the dismissal of accountability of those institutions, and the lurking possibility that smaller players are being scapegoated for larger dysfunctions. So what to make of the murky ascription of gang membership to Dylan and his supposed “confession”? It’s conceivable that Dylan had indeed been intermittently making this claim at times when he felt threatened and wanted other kids to stop menacing him. By the time he hit ninth grade, school had already been a place of danger and conflict for years. Apparently what began as a fluid set of conflicts between various individuals — including some newcomers to the social terrain of Dylan’s school — eventually solidified into a feud between fixed groups of kids, which escalated and became increasingly racialized. As threats of violence intensified, so too did the claiming of group membership; this in turn was framed as gang membership by law enforcement and the District Attorney. Ironically, if Dylan is met with a harsh sentence, it may signal to Wausau residents that if one has a conflict with another person in town and wants to resolve the matter by going to their house with guns and knives, the justice system will look on it favorably, as long as one can convince a jury that one was provoked. By contrast, Dylan is certainly being singled out to be made an example of in this situation. In the rationale of the criminal justice system, a harsh sentence may be justifiable as general deterrence. But in this era of carceral overkill, is it justifiable for one boy to sit in solitary and while away his decades so that others won’t join gangs? A more sinister message would be this: If you are a young Hmong male, you will not receive equal protection under the law. Indeed, in effect, the justice system is saying that your life is disposable. 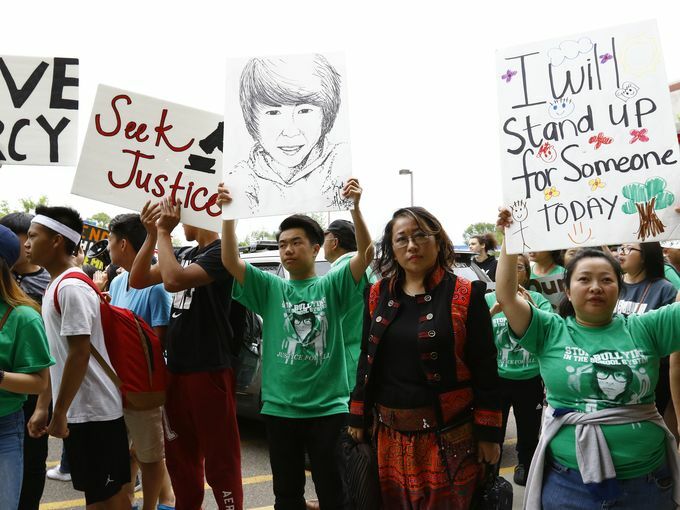 The Dylan Yang case, then, has broader implications that could shape the future of race relations concerning Hmong in the Upper Midwest. Seeking individual retribution, such as a decades-long sentence for a minor, may risk breeding more vindictiveness or even fanning the flames of ongoing friction between African Americans, Latinx Americans and Hmong Americans. Instead, perhaps this is a moment for Wausau residents and wider communities to work on healing and solidarity. In the meantime, whites seem to continue to elude these extremities of retributive justice in the Wisconsin system. In another county, 43-year-old Kevin Elberg, 6 feet tall, was charged with felony “aggravated battery with the intention of bodily harm” for having brutally beaten Hmong hunter Sao Lue Vang, age 63 and 5’3” to the point where he sustained internal bleeding and a lacerated liver. 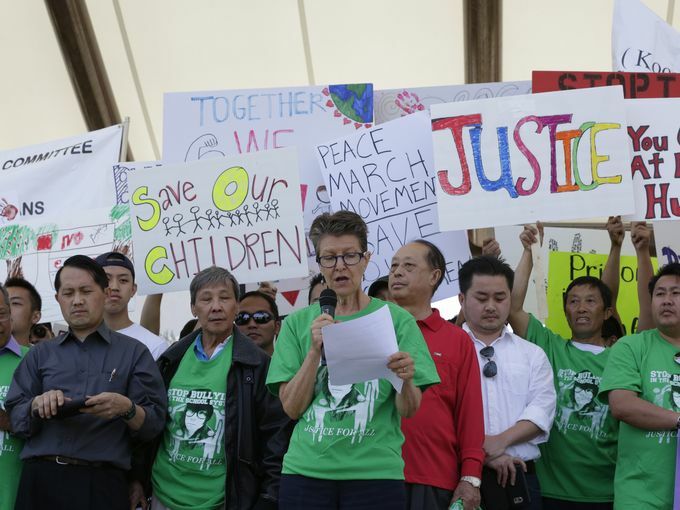 But charges were later amended to “misdemeanor battery,” to which Elberg pleaded no contest, garnering a sentence of 10 days in jail, two years of probation, and 72 hours of community service in the Hmong community. In still another county, 39-year-old, Dan Popp, charged with the more serious crime of “first degree intentional homicide,” for killing a Hmong couple and a Puerto Rican father, had bail set at $150,000. By contrast, Dylan was deemed a flight risk for having out-of-state ties; so his bail was set at a spectacular $1 million, despite him being a minor. 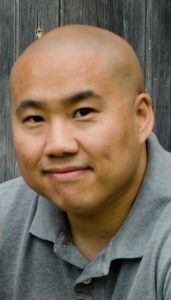 Those Wisconsinites who trust that the justice system is relatively “fair and just” may be persuaded to believe that a Hmong teen is perhaps more malevolent than an adult white male, especially if the teen is tagged as a gangster while the adult is credited as an Air Force veteran. Still, the mainstream imagination bloats with misbegotten phantasms of the Asian gangbanger. Perhaps informed by just this deep history of panic about Asian gangs in general, and specifically about Southeast Asian young men, Dylan was made into just one more of these marauding monsters. In a scathing dissent to a recent Supreme Court decision allowing the admission of evidence obtained through illegal police stops, Justice Sonia Sotomayor bemoaned the legalizing of such practices in which police can stop someone, then justify it by searching to see if they have any warrants out for them, even for traffic violations. Citizens’ suspected legal transgressions do not justify police procedural transgressions, she insisted, with the zinger: “Two wrongs don’t make a right.” But at base, her protest was precisely about the racially unequal justice that has been implemented across the United States: “It is no secret that people of color are disproportionate victims of this type of scrutiny.” Likewise, we call for attention to the more specific scrutiny that is in play when Southeast Asian boys are made into monstrous gangsters with impunity. Pao Lee Vue teaches in Sociology and co-directs Women and Gender Studies at St. John Fisher College in Rochester, NY. He has taught courses on various topics, including criminology, deviance, stratification, race & ethnicity, culture, genders & society, and is author of Assimilation and the Gendered Color Line: Hmong Case Studies of Hip-Hop and Import Racing. He has worked on projects with colleagues in Hmong Studies on issues of social justice and raising awareness about sexualities in Hmong communities. 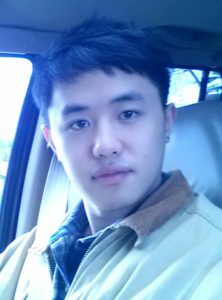 Bee Vang recently graduated from Brown University with a degree in Geopolitical Epistemologies. With a background in acting on film and on stage, and a commitment to advocacy and social justice causes, he has extensive experience in co-designing and co-facilitating workshops on media and popular culture; and race, gender and sexuality in the U.S. and China. His experience in media, policy and activism includes roles at WhyHunger, Asian Cinevision, Legacies of War, the Rachel Maddow Show at MSNBC and The Economist. 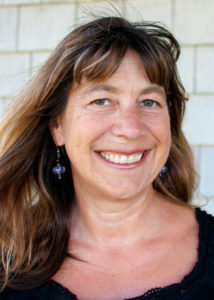 Louisa Schein teaches Cultural Anthropology as well as Women’s and Gender Studies, Asian American Studies and Critical Sexuality Studies at Rutgers. She has worked with Hmong/Miao in China and the U.S. and is author of Minority Rules: The Miao and the Feminine in China’s Cultural Politics. She has collaborated with Bee Vang , Va-Megn Thoj and Pao Lee Vue on activism, workshops, publications and a Youtube video on Asian American masculinity, sexualities and violence. She co-founded the Critical Hmong Studies Collective, and co-directed the documentary on Hmong Americans, Better Places (2011).